March 01, 2007 Today many so-called "embedded"-applications use RISC-CPUs. The reason for this decision is the architecture on the one hand, which provides very short response times. But on the other hand, RISC-CPUs are offered in broad variety, if you compare it to x86-CPUs. Developing small, power saving embedded systems and looking for "single-chip"-solutions that embed essential peripherals, you will find your solution most likely in processors with RISC-core. This is why they are being used in so many "embedded"-applications: e.g. in print-server, router etc. However it is difficult to deploy RISC-CPUs in individual applications or small-lot series, because it is necessary to develop software dedicated to the special hardware. Developers can use Linux and its GNU compilers, but still there is a lot of work left to customize bootloader, develop drivermodules for peripherals and so on. Here a new product family from VS Vision Systems could be interesting for you. Very small and at low cost these ARM9 platforms feature the open Linux distribution µCLinux. With bootloader and hardware driver modules already integrated the developer can concentrate on his application that can easily be compiled and uploaded. This will reduce development costs, improve time-to-market and overall allows the production of small-lot series. ARM processors (ARM7, ARM9) are employed by VS Vision Systems GmbH for a long time. They provide the platform for their "NetCom" serial-device-servers (NetCom Lite Series and NetCom Pro Series), which offer a number of serial ports (1x, 4x, 8x, 16x) for remote access. 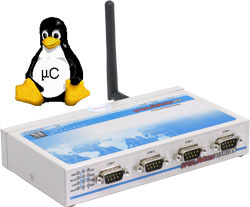 Firmware and drivers allow local access to the serial ports, although the physical device might be far away, securely connected by Internet or local network through OpenVPN tunnels. So user applications will not be loaded with network tasks. VS Vision Systems now offers this NetCom family as free programmable OpenNetCom. With OpenNetcom product developers receive a RISC hardware platform with 166MHz ARM9 CPU, 16MB SDRAM and 2MB Flash. Communication is provided by 100MBit Ethernet and 802.11b/g Wireless ports as well as a number of serial ports (1x, 4x, 8x) equipped with high speed 16C950 UART (128Byte Fifo), that may be individually configured for RS232 or RS422/RS485 mode. Additionally there are three internal GPIO connectors to be free programmed by the user. The OpenNetCom operating system is based on µCLinux - there are no license fees involved. The kernel of µCLinux is specially adjusted for employment with embedded architectures such as ARM. As Linux OS it offers all those small tools for nearly all standard tasks (like networking, serial communication, filesystem, etc.). Your own applications for OpenNetCom can be developed on any Linux system of your choice. You may compile it with GNU Cross-Compiler for ARM-platform, upload it subsequently using FTP and start it on OpenNetCom Linux system. Of course you may change and recompile the µCLinux kernel itself. You may debug with gdbserver from the remote computer, or debug the kernel as well with kgdb - there you need the console port on the additional service-board for OpenNetCom. This service-board also offers JTAG and 3 LEDs for development and testing. Driver Modules for the specific hardware of OpenNetCom are installed and configured. Their functions are offered through proc filesystem and the corresponding ioctl functions. RedBoot partition with code of bootstrap loader. This partition is writep-rotected by hardware, so OpenNetCom can be shifted to factory settings after operating errors. JFFS2 is also a compressing filesystem with journaling functions for flash. Configuration data and user applications are stored there. Because OpenNetCom uses Linux as operating system, developers find a nearly inexhaustible pool of programs and tools for their individual tasks. As an example it is very easy to configure OpenNetCom as backup router, where a LAN (or WLAN) is connected to ISP over serial modem or ISDN. OpenNetComs very fast serial ports even allow Multilink PPP connections for data transfer. Also you can use OpenNetCom for time-critical applications in the areas of industrial automation. There all time-critical data communication and processing can be done directly on the fast reacting OpenNetCom RISC CPU. Slow responding Ethernet will be used for monitoring and configuring these processes.